With the firings of executives, sentencing of Bill Cosby, and Supreme Court nomination hearings, accusations of sexual harassment and assault dominate the news. This behavior is driven by a deep-seated, abiding culture that objectifies women and damages both genders. It perpetuates a cycle of shame in both men and women and encourages aggression against women. 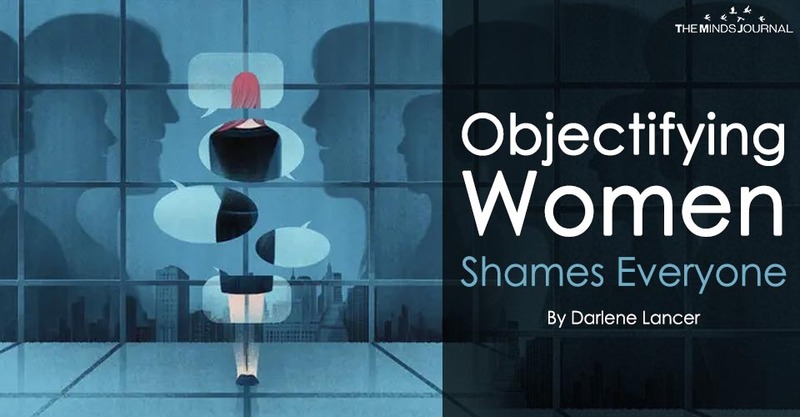 Even if never overtly harassed or assaulted, women experience the destructive effects of sexual objectification, including abuse and violence, eating disorders, body shame, depression, risky sexual behavior, and sexual dysfunction. Men don’t realize how sexual shame also harms them. Sexuality brings abundant opportunities to exaggerate both our vulnerability and shame, to feel pleasure and close, but also to feel unworthy, unacceptable, and unlovable. Boys must separate from their mothers to establish their masculinity. To accomplish this task, they look to their father. They are also influenced by peers and cultural standards and role models to define what it is to be a man. Often, masculine ideals of toughness, success, and anti-femininity are promoted. This objectifies men to be other than themselves. I was invited as a therapist to attend a ropes course that challenged young teens at risk. The challenges were designed to be frightening–even to adults. Over my objections, one of the male leaders brutally shamed any boy who showed fear, and worse, tears. He traumatized the boy while re-enacting abuse he’d likely received growing up. This is how shame gets passed down.